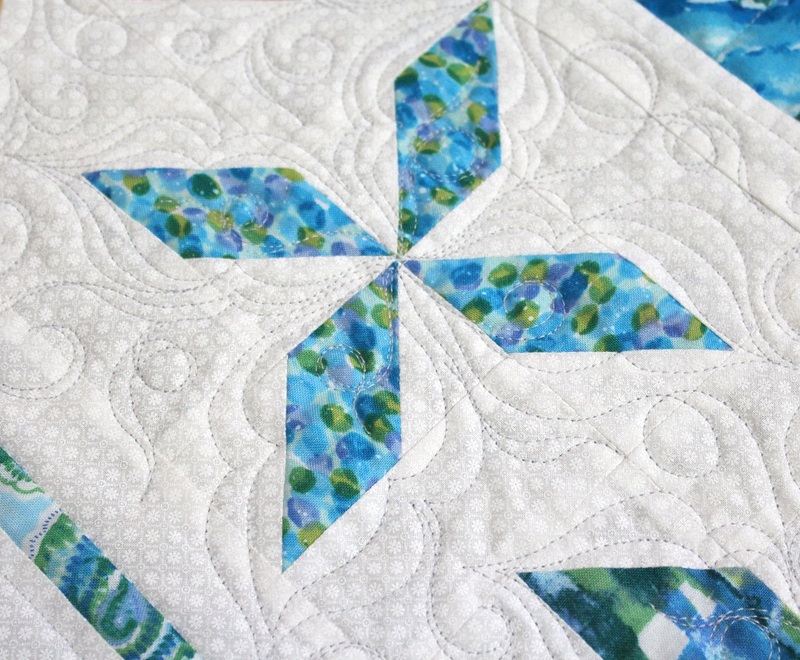 Oftentimes, my planned quilting scheme doesn’t work out when the actual quilting starts… and such was the case with Visions of Azure. I had planned to quilt formal feathers. But in the end, I decided that I needed an airy feel for the spinner blocks, and the feathers would end up making the overall look too stuffy. 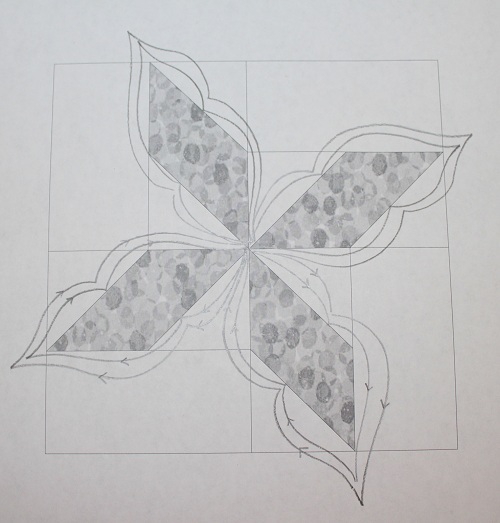 The new quilting scheme turned out to be a fun way to quilt spinner blocks, and I share with you the schematic in the following. Starting from the spinner center, I quilt a curve to about the mid-way of the long side of a parallelogram, and then round off with a tip at the top of the parallelogram, before curving back down to about the mid-way of the long side of the parallelogram – at the other side, before curving back down to the spinner center. I then echo once. Then, it’s a matter of filling in with fillers like tendrils, swirls etc. See what I mean about the airy feel when quilting my spinner blocks this way? I look forward to be able to show you the quilt in its entirety. Stay tuned for details. Hugs to you all, and have a very lovely week. 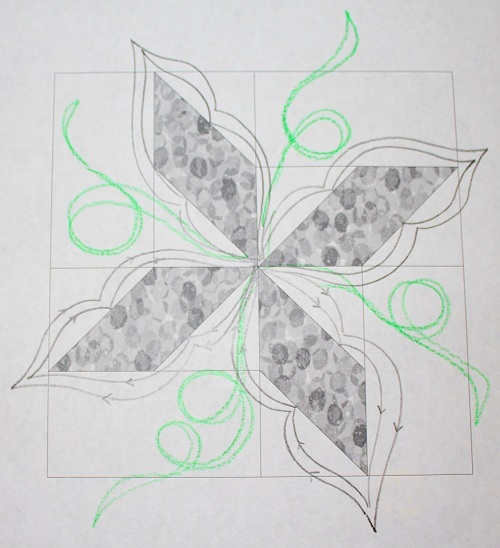 This entry was posted in Quilting, Thread Talk and tagged Free-motion quilting tips, Quilting around spinner blocks, Wendy Sheppard. Bookmark the permalink. That is a great design and one that I would have never thought of myself. You did it beautifully on that quilt. I love the way it turned out! On the quilt I just finished, I had plans and ideas of how I wanted it to look when it was done…but things didn’t work out and all of the quilting changed to something that fit better, or quilted better, or looked better. It’s one of those quilts that had a personality to it and it shone through, I guess! i like it. thanks for sharing it. Thanks for the great ideas Wendy — the pictures look intriguing… Can’t wait! The sneak-peek looks very attractive. As always I love your quilting, its just beautiful. Nothing wrong with not sticking with the plan when the outcome is so beautiful! It’s so pretty, I wanna try this one! It’s great how you share your ideas. This stitch makes a gentle quilt! Love the azure on the white! that alone sells springtime. the airy quilting pushes it even more into blue skies and soft warm breezes. Just lovely. Looking forward to seeing the whole quilt, too, one day. Keep warm! what’s another arctic blast among friends?! Lovely! Thanks for sharing, I want to try this! I visit your blog most every day and appreciate it so much. Very pretty and I agree that light and airy was just the right choice! Love to see your planing drawings! I really love that idea and thank you so much for sharing how it is done. I can’t wait to try that myself.